Unless you’ve been under a rock this week or have virtually zero interest in technology, you couldn’t help but hear the news about Apple’s recent product announcements. Interesting enough and typical for Apple, the new MacBook Pro has immediate availability – unless you want to buy them from Best Buy. Who dropped the ball? Best Buy for not demanding stock on the hottest item since the 3rd generation iPad ? Or the channel rep for Apple for not being aggressive enough to make sure their customer got inventory. I’ve never been one for placing blame but rather focusing on the solution. Fear, I believe is the underlying factor. As small business owners, we should never be afraid. Granted there’s a fine line between fear and caution. I think there’s somethings to learn from this #fail of these two large companies and they lost their perspectives. I remember when I went through my first simulated combat situation when I was in the Marine Corps. It was not a live fire drill but for a young Marine not too many months out of boot camp and never before in that environment it was terrifying. The “enemy” seemed like a overwhelming force that greatly outnumbered us. The strength of the M50 machine guns reverberated in my chest and the noise hurt my ears. The rockets and small arms fire would briefly light up the night and then return to darkness in the blink of an eye. I wound up in a small foxhole with a Master Gunnery Sergeant who had almost 30 years in the Marine Corps. I confessed, “I’m scared!” and replied “Good, that’ll keep you alive sometimes. Now, get up there and give ‘em hell!”. In that moment, I realized that probably all of the guys my age were scared and that’s exactly why they were conducting this exercise. That simulated battle seemed like it lasted 2 or 3 hours but it was only about 20 minutes. The “overwhelming” force that had attacked was a squad of recon rangers of about twelve. Spread out and moving their positions made it seem like there were a lot more. And, of course, this was just a drill and not actual combat but our casualty rate was estimated to be at 40%. 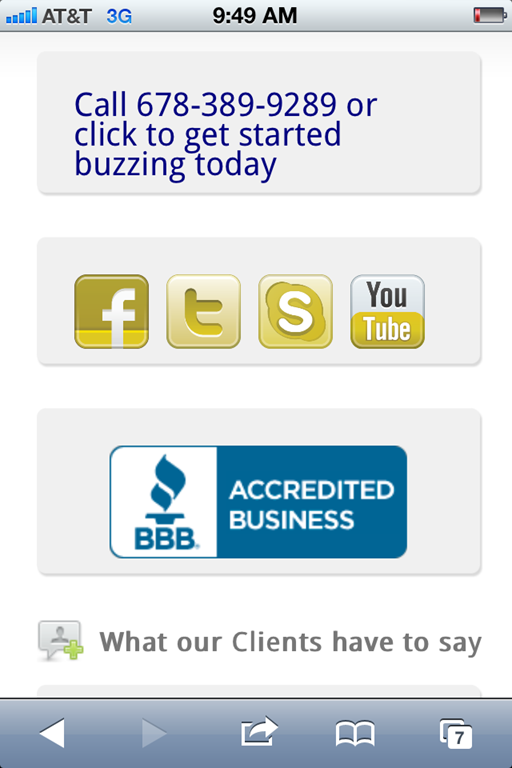 What does this have to do with small business websites? Don’t be afraid to ask your provider for what you need. Don’t be afraid to try something new on your website. Most of all – WORK IT and MAKE IT HAPPEN. 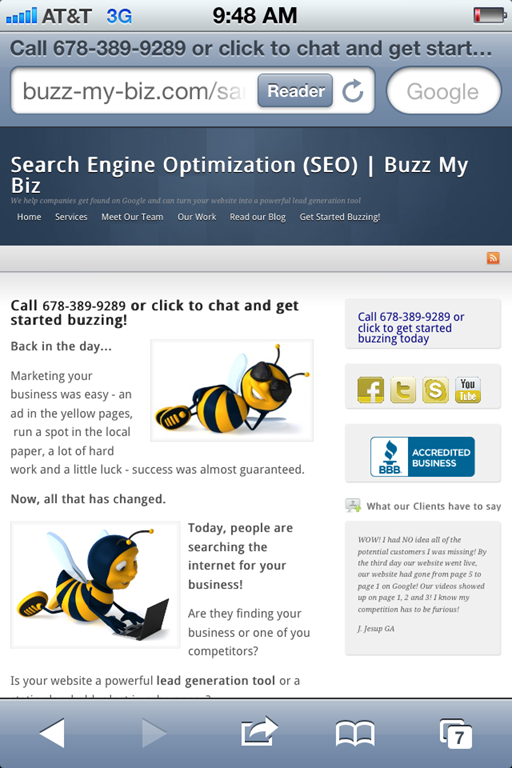 At Buzz My Biz, we specialize in bringing unique strategies to your small business website. Call or click today and find out how we can help you take your small business website to the next level. One of my favorite feeds is from SearchEngineLand and when I read Analyst: Mobile To Overtake PC For Local Search By 2015 I felt like all the work we do at Buzz My Biz educating our clients on the importance of having a mobile-enabled website was worth it. What’s most important in this article is that it is centered around “local search”. Local search, is defined as “geographically constrained searches against a structured database of local business listings.” (Source: Wikipedia.com) Attention Small Business owners – they are talking about your core demographic searching for your products and services! Making your website mobile-friendly is something we feel so strongly about we include it in every website we deliver. Some companies will try to sell you a companion website to compliment your “desktop” website. We caution companies against this. Ideally, you’re going to be updating content on your website twice a week. If you are doing it, you’re paying someone else to do it. Do you want to double your/their workload? When mobile-enabling your website there are several things to consider. Forget flash. It pains me to say that as I have been developing flash websites as a flex developer for years but unless you’re in a totally closed environment like a company intranet, it’s no longer the right solution. Period. Reduce image sizes. While 4G connections continue to proliferate especially in Metro Atlanta, many areas in South Georgia still only offer 3G speeds and some places are more prone to less. It’s just nice to be cautious and when sizing images, choose the one which most closely matches the actual area size you are trying to fit an image in rather than using large image sizes. You’ll find that reducing images in Photoshop or your favorites image editing software, will come out substantially better than allowing WordPress to “crunch” it down. When placing video online, we use YouTube as our video host and rather than using the normal embed code we use a short IFRAME tag which allows the video to play easily on any mobile device including iOS devices like iPhones and iPads. if you’re ready for an upgrade or are working toward a new website, consider hiring a firm like Buzz My Biz that is expert in providing not only web design and development services but also search engine optimization and has experience in building websites that are mobile-ready. I’m ready for a mobile small business website! When small business people decide to engage an Atlanta SEO Expert like Buzz My Biz, we always get asked the question “how do you do it”? Believe it or not, the secret sauce is not a secret at all. It’s just about being honest and sticking to the point. First, let me preface this “spillage of the guts” by saying we are talking about “on page SEO” rather than “off page SEO”. Think of “on Page SEO” as stuff we do to the website. “Off page SEO” refers to things like link building, social bookmarking, social media and the like. First let’s examine the anatomy of a page. Most important is the page title. It should accurately reflect a unique subtopic of your subject matter. For example, if your subject matter is furniture, you may have a page devoted to kitchen furniture. You may also have pages devoted to subtopics of kitchen furniture such as tables and chairs. When you decide what the title of your page will be, it should be reflected in the <title> tag, the URL, the header tag (such as an <h1> or <h2> tag) and those keywords within your title should be used generously within your content. One of the most important things which cannot be understated is when I used the term “unique subtopic”. Too many topics on a page is analogous to my wife discussing too many topics at once. I end up shutting down because I can’t keep pace. Google, in the same way, figures that you’re trying to rank for every keyword known to man and heads toward the O-F-F switch. It’s best, and this is hard won experience talking, stick to a single topic for each page and your chances of ranking for that page will be exponentially better. 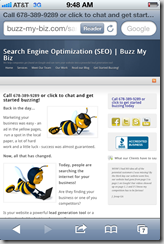 If you need an Atlanta SEO Expert, give Buzz My Biz a call and we’ll see how we can get your website positioned better among your competitors. 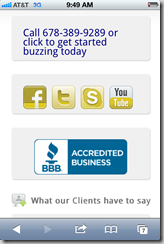 I’m ready to get my business buzzing! 1BILLION dollars. It’s a staggering amount of money just to think about. That equivalent to the annual profit of General Mills! So why in the world would Facebook see the value of spending such an extravagant amount of money on something which from appearance sounds utterly foolish. What’s more interesting is this – what can we, as small business owners, learn from this? Imagine Facebook without photos. Gee, that’s a really a dismal thought. Remember back, not so long ago, when the Facebook mobile app regularly failed sending pics from your mobile device to the Facebook server? Now think of Instagram. It’s way more than just another photo filter camera app. It’s differentiating factor and, IMHO, the whole reason Facebook even considered it is the fact it’s built around a social network model. Okay, now we get to the crux of the matter. It’s all about relationships. During an internal sales call the other day, Allan Anderson our Vice President of Sales commented about how much sales has changed in the last twenty years and that now it’s really about working relationships. Allan could not have a more correct assessment of today’s marketing efforts. As we expand as a country and a culture, it’s more important than ever that we reach out to those around us when we enquire about products and services. The first thing I do when considering a purchase is to ask one or two friends if they know a company who provides that product or service. If they recommend someone, I almost ALWAYS go with that. The secret to sales is to make yourself available in the crowd. Don’t be a wallflower. Get out there and participate and continue sharing your passion about what you do. At Buzz My Biz, in addition to building great looking, professional websites that rank well on Google, we also provide monthly plans which provide content for your blog and post links to that content throughout your social network. Most small business owners already feel the need to grow another hand and they know that social media needs to be done but they run out of hours in the day. I wouldn’t be writing this blog on a Sunday if I didn’t empathize with that. If you want to get to point B, you must first know where you are, Point A, right? Well, if the woods are on fire, I guess any course AWAY from the fire is a good one. Enough analogies and let me get right to the point – if you aren’t actively tracking your website activity and analyzing those reports, then you really don’t know much about how your website is performing. it’s easy to say “we’re not getting any calls” or “we don’t show up in search results”. What’s harder to figure out is why. On the other hand, let’s say that you engage Buzz My Biz, or some other SEO/Web Design firm to help you with your website, rankings and conversions. How do you know if we’re doing a good job if you have no reference point? Many businesses use before and after photos to showcase their products and services to their customers. Collision repair shops, home remodelers and many other businesses can easily show how great their work is. How can I show you what an awesome job we do on SEO if I don’t have a before picture? Well, you aren’t alone. More than 90% of our customers have no idea what kind of traffic they were looking at before we cam onto the scene. If you have a website, this is so incredibly easy you’ll shoot yourself for not having this installed on your website. Go to http://www.google.com/analytics/ and use your Google account to login. A few simple steps to verify ownership of your website and your be given a small code snippet to insert on each page (or the header/footer include) of your website. You’ll gain INSTANT knowledge of how many visitors your website is getting, what content they are looking at, what keywords they found your website with, where they’re from and just about ANYTHING you could ever want to know less than name, email and phone number. Even if you’re not ready to engage an SEO company or re-work your website, I strongly urge you to install Google Analytics right away and start looking at those reports. It’s fascinating, I promise you! When I consult with clients, they always ask me two things. How fast can you get me on page one of Google? How do I stay there? Just like shady deals can score you some quick money, shady SEO tactics (called “Black Hat SEO”) get you ranked well for a short time. Normally, just like bad business practices, the truth eventually comes out and that train comes to a quick end. Your ultimate goal is for Google to consider your website a subject matter expert. Are SMEs created overnight? Ha, we wish! Unfortunately, of course the answer is no. This is really about reputation. Like most reputations, a good one takes time to build and is easily destroyed. Back to the question at hand though… typically, you should be ranking for your relative search terms within 30 days. Page 1? That all depends on the competition for your particular industry and target locations. Any SEO company who PROMISES they can get you on page 1, is either going to get you ranked for specific long tail keywords or using some technique which is shady. 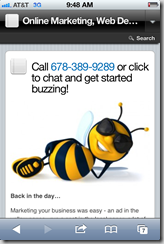 At Buzz My Biz, our goal is to get you ranked for short tail keywords in particular geographic locations. Next question, you maintain a position through growth. There is no “treading water”. You’re a shark – you’re either moving forward or dying. You can think of Google as a dog. A dog loves the guy who feeds him. Feed the dog, the dog loves you. Ignore the dog, the dog ignores you. Remember, our ultimate goal – to get Google to consider you a subject matter expert. While most of us in the SEO world consider Bing as an “also ran”, that may change this fall. This week also came news from Google competitor Yahoo! that they were “reorganizing” it’s workforce by laying off roughly 2000 workers. One would think that Google has it all but wrapped up, but I think that Bing shows promise that this fall may be just the beginning for Microsoft-owned Bing. I based this theory on a few key events which will synergistically arrive this fall. Windows 7, with an RTM date of July 2009, has had a glorious three year run. Coming on the heels of a Vista misstep, Windows 7 fought a long, hard battle for acceptance in the corporate world. Windows 8, with a rumored release date of October 2012. Based on it’s Metro-style interface of Windows Phone and XBox360, Microsoft is betting the farm on it’s newest pony. It’s been three years since Windows 7, the economy has been tough and I think people are ready for the upgrade to Windows 8. The significance from an SEO perspective is the default browser for Windows 8 will be Internet Explorer and the default search engine will be Bing. Certainly, there will will be many who will immediately install Chrome or Firefox, but look for a big uptick for both IE and Bing as users buy new machines with Windows 8 preinstalled. Also coming this summer, is a new era of Ultrabooks with the Ivy Bridge CPU that promises lower costs and better performance over the current Sandy Bridge CPU. With tablets stealing all the press time, you would think that no on is buying computer anymore, but for most of us we still require the horsepower and application consistency that can only be found in a true computer. Naturally though, we want that laptop to be the fastest, lightest computer that we can possibly afford and hence the Ultrabook. This class of laptops is known for it’s lightweight and speedy bootup times, thanks in part to solid state drives. If all other tablets take a cue from the iPad, all Ultrabooks are a knockoff from the Macbook Air. I think that most people who want an Ultrabook will try to wait a few months until they can get theirs with Windows 8 preinstalled. While I don’t think Google will be toppled from it’s “king of the mountain” role any time soon, I do think that Bing may gain some traction beginning this fall for at least a six month period until people tire of Internet Explorer, grow into their new Ultrabooks and begin installed other browsers that don’t use Bing as their default search engine. As mobile users continue to grow, it’s important for our customers (and potential customers) to understand what the definition of a website being “mobile ready” actually means. According to ComScore’s 2011 report titled “The 2010 Mobile Year in Review”, 36% of Americans reached the internet through a mobile device. With those kind of numbers, making your website mobile-friendly can no longer be ignored. Some people think if you website is accessible via a mobile device then it must be “mobile ready”. Nothing could be more frustrating for mobile users. So what does a non-mobile website look like to a mobile user? WOW (you say)! I know what you’re thinking… A) I couldn’t read that even with my special xray vision reading glasses. and B) no problem, I can always zoom in, right? Now, how would you like to navigate a website like you’re holding a paper towel tube up to a 17” monitor. How long do you your potential customer is going to suffer through that? So, what’s the answer? To provide a customized viewing experience for your mobile visitors. One challenge that you DO NOT want to deal with is to maintain two separate websites, one for mobile and one for desktop. The problem lies in that when you change or add content (which we recommend adding content twice a week) you have to do so in two places – essentially doubling your work. Our solution provides the same simple interface to make content changes in a single place and still provide a premium user experience regardless of their device. This provides a single framed experience where the user can simply scroll through content at the flip of a finger. Mobile nirvana achieved. Are You Committed to Your Small Business Website? Over the last few weeks, I’ve spoken with clients and prospects concerning the need for fresh, updated content on their websites in order to achieve and maintain their desired ranking. One thing to realize is that one must be committed to do this. It takes a lot of hard work to turn things around if your website had previously been going in the wrong direction. It takes time to build a following of your online community and it takes time to build content which lets the search engines know that you are indeed a subject matter expert on your relevant topic. But, this takes dedication and commitment. One of the most memorable inspirational stories I treasure involves Hernando Cortez, the great explorer and Spanish conquistador. In 1519, the Aztec Empire was between 5-6 million people. Cortez brought a force of approximately 500 to establish a Spanish colony and seize gold for the crown. 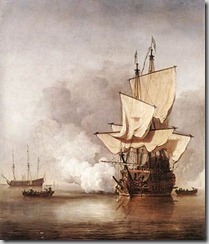 His men were grumbling the entire voyage and fearful against overwhelming odds in a foreign land. Rumors of mutiny abounded with the goal of taking command and returning in the ships to Spain. Upon landing, Cortez ordered the ships burned. Their options limited, the only choice was to succeed or die. 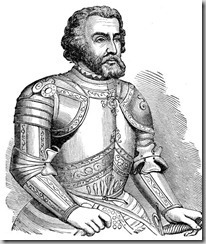 By 1521, Cortez had defeated the Aztecs, not only by superior weaponry and military tactics, but with an overwhelming sense of commitment from his troops. Building an online presence, especially if you are starting from ground zero, it not a task for the faint of heart. 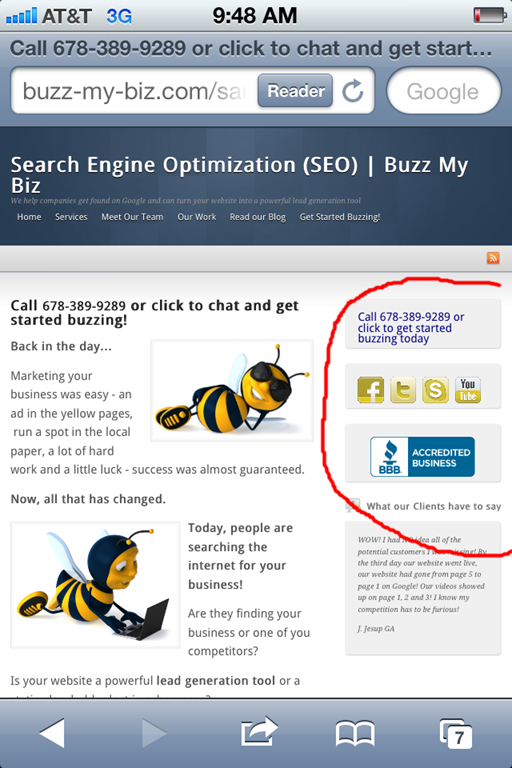 Buzz My Biz is dedicated to helping small businesses achieve their online marketing goals by increasing your online visibility to search engines and building an online community centered around your brand. It’s hard to believe, but almost 18 months ago the iPad was a product that no one needed. Tablets were deemed to be in a no man’s land – not powerful enough to replace a computer and not enough features to distinguish it from it’s smaller, lighter cousin the smartphone. In less than two years, the iPad has defined a new category of computing and signaled the end of desktop computing as we’ve known it for almost thirty years. The iPad is the undisputed leader in the tablet market with not one strong competitor even able to mount a formidable challenge to it’s unbridled reign. The iPad has gone from something no one really knew they even needed, to the most sought after high-tech indulgence one can possess. 25 million people can’t be wrong! How does this impact your small business website? 1) Flash is dead, long live HTML – Prior to Steve Jobs departure, he let it be known – the iPad and the iPhone will never, ever support Flash (Adobe’s multimedia technology which has powered online video and animation for close to a decade). If your website is centered around using Flash, begin planning your redesign and get started on implementation as soon as reasonably possible. 2) Light is good – The faster your website can render onto a device, whether we’re talking about a desktop or a mobile device, the better! Once of the key elements of “web 2.0” is the minimal look. There’s no need to have huge graphics. With proper image optimization you can have images of whatever size you need without being bloated. 3) Format for Flow – When you are formatting pages and blog posts, keep in mind that they made be viewed on all types of devices. That means your perfect layout, may look absolutely horrible on the small screen. Test or on all sorts of devices. If you are lacking of devices, send a Facebook post out to your network asking for people to check it out. 4) Got an app for that! – Realize that not only may your content be rendered on different types of devices, your content may be viewed in a content aggregator like FlipBoard. What will your content look like? 5) Hi-Res or more like Pez? – Are your images blurry, fuzzy, or pixelated as a Pez Dispenser? They’re really going to look crappy on a high resolution device like an iPad. Replace poor quality images on frequently viewed older content and when purchasing new images, go ahead and get the hi-res versions for your new content. Your users will love you for it. 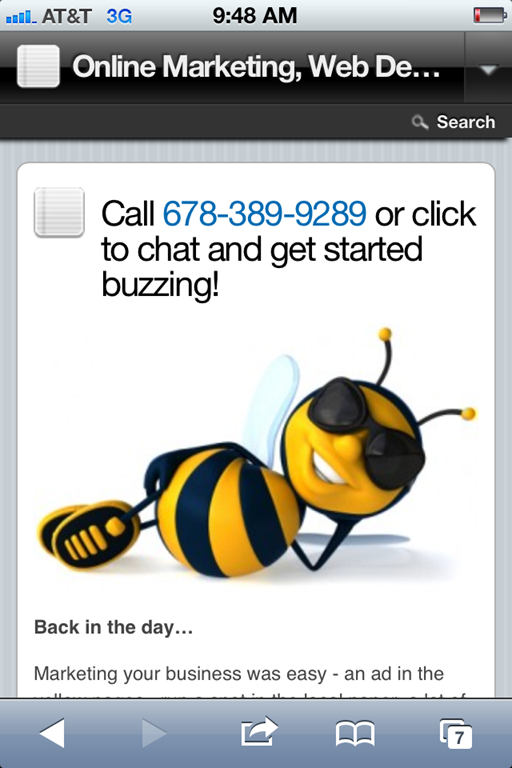 Buzz My Biz has been at the forefront of making websites mobile-friendly for more than three years. Our experience and expertise can make your small business website a star!